Death may be unexpected or expected. Sometimes it is a blessing after a long period of suffering. Often, especially when it strikes the young, it is cursed. But death is always tragic. A human being is gone. In this section, we endeavor to capture, remember, and perhaps immortalize at least a little of the lives of those who died and were buried in Percy Cemetery. This is important because many of these people were the pioneers and builders of the community in which we now reside. They are the history of Frostburg. Because of this simple fact, they deserve to be remembered and we deserve to know who they were and what they did. Very few of those in the cemetery are famous or important. Most were ordinary people who lived ordinary lives. Yet each was a contributor, in some fashion, to community history. Our goal is to provide a sense of their contributions by providing as much information as we can about each of the people we know is buried in the cemetery. This chapter presents, in alphabetical order, a list of persons whom we know or strongly presume are buried in Percy Cemetery. We have spent a considerable amount of time trying to locate the obituaries of these people by searching through local newspaper. We succeeded in most cases but there were many failures, too. Often we are certain of a precise death date but scouring the newspaper failed to turn up an obituary. There are several reasons for this. In the past, there was sometimes a fee charged by the newspaper for the privilege of publishing an obituary. Obviously, a poor family might not be able to afford such extravagance. 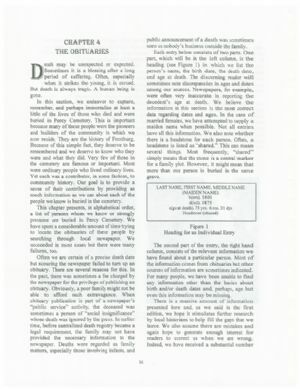 When obituary publication is part of a newspaper’s “public service” activity, the deceased was sometimes a person of “social insignificance” whose death was ignored by the press. In earlier time, before centralized death registry became a legal requirement, the family may not have provided the necessary information to the newspaper. Deaths were regarded as family matters, especially those involving infants, and public announcement of a death was sometimes seen as nobody’s business outside the family. Each entry below consists of two parts. One part, which will be in the left column, is the heading (see Figure 1) in which we list the person’s name, the birth date, the death date, and age at death. The discerning reader will sometimes note discrepancies in ages and dates among our sources. Newspapers, for example, were often very inaccurate in reporting the decedent’s age at death. We believe the information in this section is the most correct data regarding dates and ages. In the case of married females, we have attempted to supply a maiden name when possible. Not all entries have all this information. We also note whether there is a headstone for each person. Often, a headstone is listed as “shared.” This can mean several things. Most frequently, “shared” simply means that the stone is a central marker for a family plot. However, it might mean that more than one person is buried in the same grave. The second part of the entry, the right hand column, consists of the relevant information we have found about a particular person. Most of the information comes from obituaries but other sources of information are sometimes indicated. For many people, we have been unable to find any information other than the basics about birth and/or death dates and, perhaps, age but even this information may be missing.